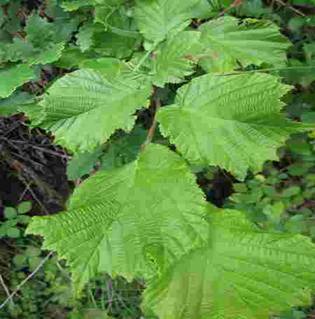 Typical distribution of leaves with ‘alternate’ pattern (hazel - Corylus) presumably to maximise photosynthesis. Another form of leaf distribution with the ‘opposite’ pattern (ash - Fraxinus). There are a few that use a spiral. Ferns thrive in partial shade. My Welsh woodland evidently originating from the Prehistoric Wildwood has thirteen species. Light powers photosynthesis, stimulating growth, which drives biodiversity, enriching and rejuvenating the woodland. Contrasting light and shade add to the diversity. eg. Yew (Taxus) a British native conifer. 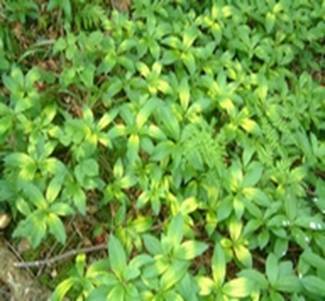 Ground flora (Dog’s Mercury – Mercurialis perernis) with yellowing indicating that the process of photosynthesis is being blocked. Not to be confused with variegated hybrid varieties. Sunlight filtering through the woodland canopy; magical. How many of us realise that it is this that provides the energy that makes the forest grow? I am indebted to Timothy Walker, Director of the Oxford University Botanic Garden, whose BBC Tv programme on photosynthesis (June 2011) captivated and enthused me to write this page (Footnote 1). In his programme he stated that- photosynthesis is “the most remarkable and important process on Earth”. Reinforcing this I’ve read elsewhere- “The importance of photosynthesis can scarcely be over emphasised because nearly all the energy entering (our) …… biosphere is derived from photosynthesis” (Footnote 2). So significant is this, I’ve read, that when we discover how to replicate photosynthesis we will be able to provide for all our global energy needs! The photosynthesis of plants is well understood; everyone knows that plants need sunshine. Everyone should know that it is the leaves that drive photosynthesis. Carbon dioxide and water are changed into carbohydrates (sugar) and oxygen in the presence of sunlight. No sunlight, no oxygen, no carbohydrates, no energy, no life. The outstanding importance of photosynthesis to our woods and forests is obvious and provides the key to biodiversity. So why do so many woodland owners continue to plant trees in the shade? 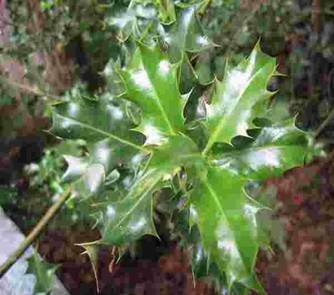 This webpage identifies the issues involved with woodland photosynthesis. It’s a complex subject and not as straight forward as it may seem at first. This is graphically illustrated by the lack of literature describing woodland photosynthesis. For a detailed and authoritative explanation of photosynthesis you should refer to the Recommended Reading at the end of this webpage. Where can we see photosynthesis in the woodland? Understanding photosynthesis is to appreciate how glades function. Walk your woodland (or forest) and you’ll observe that very little grows in the shade; the darker the shade, the less growing there. Yet where sunlight penetrates the woodland canopy diverse plants thrive: ferns, flowering plants, seedling trees, shrubs, vines - and wonderfully - birds sing. Natural glades form when a gale blows a tree down, tears off a large limb or a tree dies. These are all part of the natural woodland ecosystem and are how nature is continuously rejuvenating the woodland. This is why making glades is crucial to Natural Forest Practice (see webpages on Glade formation). Trees may change their tolerance to light and shade intensity as they grow, some being shade tolerant when seedlings and become light demanding as they grow towards the canopy. 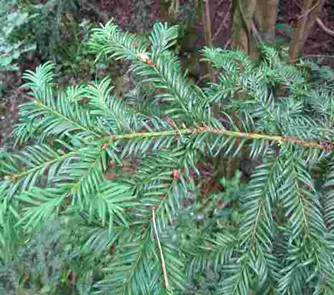 I am observing in my woodland a small yew tree that, in the shade is more or less dormant. Shading it are mature birch trees nearing the end of their lives. I anticipate that a gale will blow them down in the next decade or so, and then the yew will accelerate towards the light to meet its need for sunshine and energy to fuel its growth. In harmony with the natural woodland I could of course accelerate the process by felling one of the birch trees. Conifer and broadleaf ecosystems work in reverse. Conifer seedlings I observe in Oregon, germinate in the shade and grow very slowly, establishing strong roots so that when a gap occurs in the canopy and light floods in they grow in a mad competitive dash for the light. The broadleaf ecosystem on the other hand requires, to varying degrees, ample overhead light when the trees are seedlings. If planted in the shade, with insufficient light to activate the photosynthesis, most species wither and die off. The dominant plants will be those which grow tallest and modify the light conditions for the rest of the community. (Footnote 4). Many people do not realise that trees flower, often before the ground flora, benefiting from the light filtering through the twigs and branches before the trees leaf and make shade. The classic shade tolerant plant is the fern (photo). What makes them shade tolerant is described in Footnote 3. The amazing thing about leaves is that they are so complex and diverse. Their variety of shape, pattern, layout and function is astonishing. For example, conifer needles are modified leaves that photosynthesise normally. There is a detailed explanation of leaves in - Trees: Their Natural History & Physiology of Woody Plants. (Footnote 5). Mature trees bear anything from 50,000 to 700,000 or more leaves, providing the dense canopy that powers the photosynthesis. They are green because the chlorophyll in them absorbs red and blue light allowing the green to pass through. Sunlight is absorbed on the top side (but not always) and oxygen expelled on the underside. At night photosynthesis stops and the leaves respire, oxygen is consumed and CO2 and water released (just as we do sleeping). (Footnotes 6 & 9). Trees renew their leaves every year; generally deciduous in winter and evergreens in summer. There are bound to be some exceptions! Presumably the reason for this is that they loose their efficiency and must be renewed. (Footnote 8). 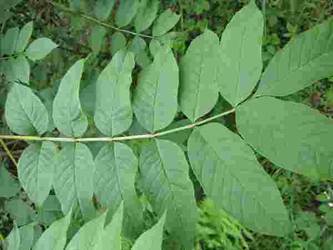 Occasionally leaves are purple and occasionally some turn white or yellow as if variegated. In the purple leaf chlorophyll ‘masks’ the green and they photosynthesis normally. In the yellow or white the photosynthesis is blocked and they are not making energy. Fungi on the other hand are not green because they do not photosynthesise, instead relying on a symbiotic relationship with other plants. Lateral shoots called ‘epicormics’ are produced when large branches are removed. It seems that these are an emergency response to compensate for the leaves lost when branches have been removed, when a tree is starved of light or ‘suppressed’. Epicormics are particularly noticeable on oak and trees that are pollarded. (Footnote 7). Climate change affects photosynthesis, principally through variation in rainfall patterns, warming temperature, increasing atmospheric CO2 and seasonal changes. To these we can add the effect on woodland of wind speed, cloud cover and humidity. Some of these are already apparent in my woodland. (see our webpage- Climate Change). Photosynthesis provides the key to rejuvenating the woodland. Timothy Walker - Director of the Oxford University Botanic Garden, undocumented. Physiology of Woody Plants, p.87. Physical Geography Made Simple, p.238. Physiology of Woody Plants, Ch.6 p.106. Physiology of Woody Plants, pp.39 & 40. Bryant R. H. - Physical Geography Made Simple - pub Heineman, London; revised 1980 (pp.224, 238 & 247). Kozlowski T.T. & Pallardy S.G. - Physiology of Woody Plants – pub. Academic Press, London, 1997 – (Leaves Chapter 2 & Photosynthesis Chapter 5). Thomas P. - Trees: Their Natural History - pub. Cambridge University Press 2000 (Chapter 2).